Living in a shared apartment in Chengde is a great way to save some money and get extra privacy. As Chengde is all about complete Chinese immersion your flat mates will of course all be local Chinese, speaking Mandarin only. 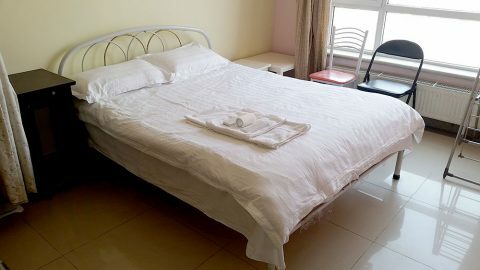 You will have your own bed room, a private or shared bathroom and full access to the kitchen, living room, and laundry machine in your apartment in Chengde. Living in a shared apartment in Chengde is a great budget option to live in this beautiful city while studying a Chinese immersion program. For your meals, restaurants are cheap or you can cook your own food at home. You will of course only live with native Chinese speakers without any other foreigners around and will therefore remain completely immersed. Your room will be spacious and comes with your own desk, chair and wardrobe. The shared apartment prices also already include WIFI and all other bills. The common areas will be cleaned regularly, however you will be responsible to clean your own room and tidy up after using the kitchen or other common areas. NOTE – Prices already include all bills and WIFI. As usual, there are no other additional costs or hidden charges. All prices are listed in Chinese Yuan (CNY). Should I choose a shared apartment or homestay? In our experience a homestay is the better option to settle into local Chinese life and improve your Mandarin quickly. However, at the same time it costs more and even though you will of course be completely free in organizing your life, you are still part of a family. A shared apartment offers complete freedom, however in our experience the main advantage is the cost savings. It is completely up to you of course, but if you can afford it we recommend you to go with the homestay option. If you are on a budget then a shared apartment is a great choice to still experience complete immersion without spending too much money. Are these apartments different to the ones in Shanghai or Beijing? Yes they are. If you study a Chinese immersion program in Beijing or Shanghai you might be staying in our shared apartments there too. The experience however will be quite different to Chengde. In Chengde you will not only not have any foreign flat mates, but there will be not a single foreigner living in the building, street or whole district. Especially in Shanghai, but also Beijing the environment is much more international. While China is a very open country these days, whether this is ok to bring someone home to stay over night will depend on your flat mates. Not everyone feels comfortable with having someone they don’t know stay the night. If this is something that’s important for you, please make sure you tell us in the registration form we will ask you to fill out before starting your course, so we can choose the right apartment and flat mates for you. Who will be my flat mates? You will be living together with local Chinese only. Who this will be will depend on the flat, but flat mates are usually local university students or young couples. Yes of course you will get the keys and you will be able to come and go as you please at any time. How will I find my apartment on the first day? With the Chengde survival kit an LTL Chengde team member will pick you up from the train station and take you to your apartment. The Chengde survival kit is already included in most of our Chinese gap year and all of our Chinese immersion and multi city Chinese courses in China. Can I book a room if I don’t study Chinese at LTL? As we always place only one foreigner per apartment it is a lot of work to organize a suitable room for exactly the duration needed. Therefore we only offer this service to our language students. All apartments are centrally located in the city, with shops and restaurants close by. Sometimes we have rooms available on very short notice too so is always worth asking if there is availability right now. However, in general you will want to book your room as far in advance as possible, as the number of rooms is very limited and quickly fill up. Just fill out our contact from on this page and let us know what you want. You will have a reply within less than a working day. Have a look at this info graphic on how to sign up for a Chinese course and accommodation with LTL.